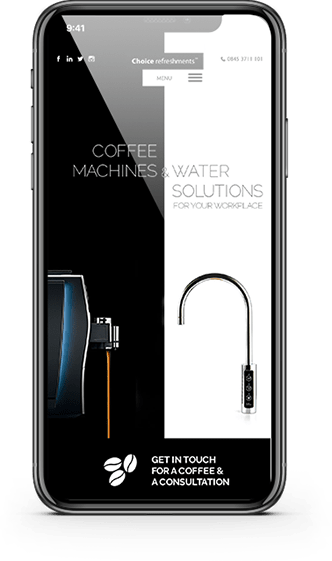 Choice Refreshments provide high-end coffee machines and watercoolers for offices and workspaces around the UK. They came to us for a website ‘reskin’ – their existing website worked well functionally but didn’t accurately reflect the quality of their brand. Choice Refreshments had only recently had their website designed and developed but weren’t happy with the aesthetic appearance of the site or their lack of leads through the website. They also wanted to drive much more traffic to their website, but weren’t quite sure which channels would be best to reach their target audience of decision makers in schools, hospitals and offices. We came up with a plan which suited their budget and their business goals. We created a design for the Choice Refreshments homepage which really showed off the sophistication of the products that they supply to their clients. 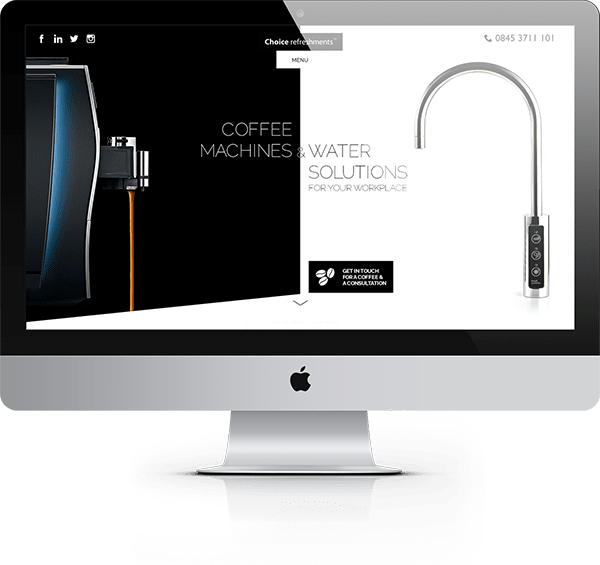 The two main services that Choice Refreshments want to promote on their homepage are the coffee machines and the watercoolers, so we decided to split the homepage in two to display the coffee machines on the left and the water coolers on the right. The monochrome takes the company branding to another level of sophistication and makes the products really stand out. For a touch of fun with the design, we included the trickle of coffee pouring from the coffee machine and landing into the cup in the footer. We incorporated a quick contact form on the website which pops out for the user to enter their details quickly and easily. We also added in contact forms throughout the website, and reduced the number of fields and thus the number of details requested from the user. We also added client testimonials to the site to provide social proof, proven to improve conversion. Finally, a sticky navigation was included on the internal pages, with the contact number permanently visible on desktop, and clickable on mobile. Prior to the website reskin being implemented, we worked on the domain authority of choicerefreshments.co.uk by building external links to the website from relevant and high authority websites. We also worked on the SEO and the development website to improve the internal linking structure, on page content, site speed, and improved the metadata. 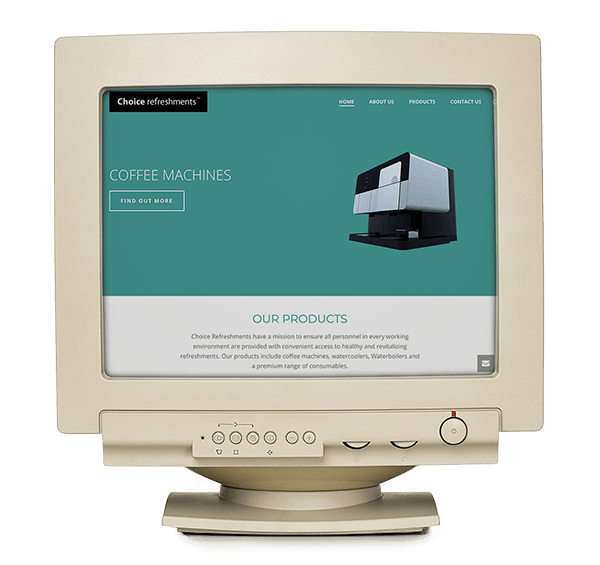 Once the new website was set live, we have continued to improve the quality of the copy on the website, prioritising the coffee machines and then the watercoolers due to those being the best sources of revenue for the client. We also write a monthly blog for Choice Refreshments to share on their social media profiles. These are written with the target audience in mind, with the aim of creating content that decision makers find interesting and want to read. This way we are getting the Choice Refreshments brand in front of businesses who are likely to need the services they offer.